SEOUL (Reuters) - North and South Korea held their first three-way talks with the United Nations Command (UNC) on Tuesday to discuss ways to demilitarize the border as the neighbors push for peace, South Korea's defense ministry said. Tuesday's meeting followed a North-South summit last month at which the Koreas agreed to hold talks with the U.S.-led UNC, which oversees affairs in the Demilitarized Zone separating the two Koreas, to smooth the way to disarming one of the world's most heavily fortified frontiers. "They discussed practical issues regarding demilitarization steps to be conducted in the future," the South Korean ministry said in a statement. 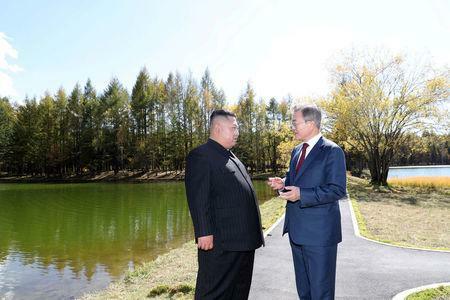 Despite this week's talks, North Korea has sounded some sour notes, blaming Seoul for delays in implementing agreements and denouncing the United States for insisting that international sanctions must stay in place until Pyongyang gives up its nuclear weapons. A commentary on the official North Korean news agency KCNA on Tuesday said this amounted to a "barbarous strangling" of North Korea and it would be difficult to make "even an inch" of progress in talks while sanctions remained in place. The commentary also took a swipe at U.S. President Donald Trump, saying he had "bragged" of big progress after his June summit with North Korean leader Kim Jong Un and questioning what this meant if a hostile policy remained in place. "President Trump has been very clear that sanctions relief will follow denuclearization, and the sooner we get to that point the sooner we can lift sanctions," a spokeswoman said. She said the U.S. special representative for North Korea, Stephen Biegun, held talks with Russian Deputy Foreign Ministers Igor Morgulov and Sergei Ryabkov in Moscow on Tuesday and emphasized "the need to continue fully coordinated communication to ensure that denuclearization proceeds as quickly as possible."